This summer- in addition to teaching at the college music programs of ARIA, Texas Music Festival, and the Panoramic Flutist- I am spending five weeks in a serene country town in Western Massachusetts at a special place called Greenwood Music Camp. 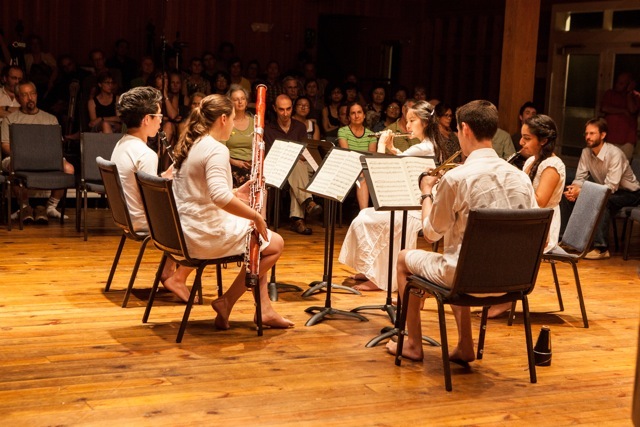 This chamber music program, for high school string, wind, and piano students, is where my husband, twin three-year old sons, and I are in residence. 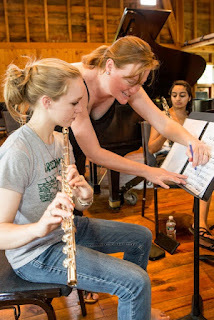 As an alumnus of Greenwood, I was thrilled to be asked to be part of this community and am delighted to contribute as a flute teacher and chamber music coach. 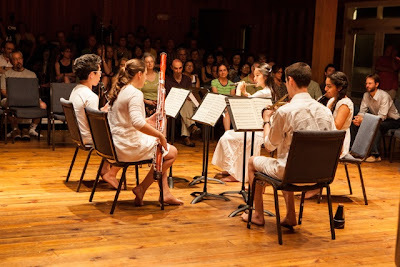 Each Saturday night the campers gather in a beautiful concert hall disguised as a New England barn to perform the weekly chamber music assignments. These performances are packed with passion, energy, and spirit; the barefoot campers, dressed all in white, perform to an enthusiastic audience. As a college professor, I cherish these few weeks to connect with a younger demographic and to focus exclusively on the intimate communication of chamber playing. Oftentimes chamber music does not play the integral part in younger flutists’ activities that it does with string students, although it is just as valuable for us! I have been challenged and rewarded by discovering and programming our own gems, while savoring an amazing summer as joyful and tender as I remember from my own youth. I like to join the music camps. Thanks for sharing about Greenwood Music Camp. The main reviews i read more on these camp will be that they are cooperative and help you for quick music learning. Greenwood Music Camp is really awesome they have professional musician which have enough experience. They have best remixing planet for youngster.